Astrology is a unique method of interpretation of the correlation of planetary influences. It is remarkable that the important events of life always happen at astrologically important moments. The ancient genius Hindu astrologers, through their Divine insight, dwelled deep into the Astronomical phenomena with respect to the minute concept of time and laid down astrological rules for different events in the life of human beings. This report is an extremely important tool that can manage your future and your life. It may depict your astrological autograph from birth to the end of your life. According to Vedic Astrology, your life in this world is the sum total of the effects of your Karma from all your past lives and the effects of your Karma in this life. Through this report, you may gauge the rising and falling trends in your life at various stages and take necessary precautionary and remedial measures when negative trends are indicated. age with much peace and calm in general. this report and also falling in this segment. 'Downs' or major successes and failures will be felt least. Till now, these were the results based on broad classification providing you a bird's eye-view of your life journey. Now I will proceed to pin-point exact age years which may be significant and 'memorable', either in positive or negative sense. As mentioned already, these are the results of past Karmas and Destiny and which probably cannot be altered by our own efforts. However, one can make contingency plans through one's efforts to minimize the impact. Following age-years of your life may be categorized as "Good years". You can expect quite good results in various spheres during these particular years of your life. Your efforts will prove profitable and productive. But remember that your astrological signatures during this period would be just shade above the average line and therefore you should not expect astrological favours beyond reasonable limits. The following age-years may be categorized astrologically "Average" in general. During these years of your life you should expect a mixed bag of results in various fields of your life, neither very sweet nor very sour, that is what you should expect. The following age-years of your life will remain "Somewhat unfavourable". You may find unexpected negative happenings coming your way during these years of your age. You will feel getting less or no desirable results. Your efforts will remain unproductive or meet with delays. Following age-years may prove some of the "Most Unfavourable years" coming in your life. Your astrological signatures would be at rock-bottom during these years and you should remain extra cautious when you are about to enter these years of your age. You may perform very poorly. You may be overwhelmed by obstacles and difficulties. Crisis may appear or prove unmanageable. You may feel vulnerable or fearful. Make attempts to maintain a low profile and try not to take important decisions in crucial matters during the indicated years. You should not be unduly proactive and should observe extreme prudence and caution. ** None of the age years was found eligible to be put in this category. (having astrological beneficence below 35%). The planets do act as referees and critics in this cosmic drama being enacted in our lives. They announce prizes, penalties and sometimes also put a break. Through the above analysis what I have tried here is to get a better understanding of the rules of the game of our individual life. By knowing the nature of planets, their strength and weaknesses in the horoscope, one can gain a little insight into one's life. 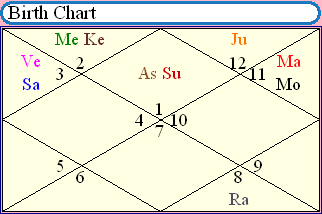 Your ordained life script scores for various "Age-years" have been computed from your Vedic Astrology birth chart. Now, being aware of your 'Good' and 'Bad' times, you have the option to choose the strategic steps that you can take at any point in your life to minimize the negative trends or strengthen the positive ones. While going through the above report, it should be borne in mind that events happen only when the right time comes depending on the back -ground. Here the three 'S' analogies of seed, soil, and season can be understood profitably. The seed pattern will be the same but when the correct soil and season come into operation only the seed will grow and bloom into a tree. Similarly the human seed would be the same depending on one’s genes and past life deeds and one’s life pattern will grow accordingly when required circumstances come into play at the required time. Through this report, I have tried to predict the 'Seasons' and 'Circumstances' part of this analogy, applicable to your life. Please acknowledge the receipt of this analysis. May Jupiter's Grace Shine on you.